I have no words for how much I adored Descendant of the Crane. It has been a long time since I read such a well written fantasy that just completely surpassed all of my expectations. Descendant of the Crane left me speechless. Not only is the world that He writes so stunning and complex, but the characters is really where she shines. Each one of them is multi-faceted and layered. They never cease to astonish us with their depth. Just when you think you know someone, they end up doing something that completely shocks you, but it never seems out of character. And I think that’s just the testament to how brilliant of a writer He is. Because these actions that propel the plot forward, that demand you keep reading, fold easily into the story. And what a story. It’s books like Descendant of the Crane where I am just astonished and amazed at the sheer level of genius. This book is like witnessing a piece of art. At first you just see the elements you like and as you listen to the lecture, talking about the history, the artist, the materials, you begin to appreciate this painting even more. Observing the brush strokes, the pressure of the paint, the way the painting moves when you aren’t expecting it. And the piece of art in front of your eyes morphs into something that becomes even more precious. Just like in my metaphor, as you continue reading Descendant of the Crane you begin to pick up on pieces of the characters, or fragments of the past, and by the time you get to the ending, you won’t be able to stop reading. I could talk about how much I adore each of these characters until the end of time. It’s not just a simple case of where I am in awe of the depth of each character, but all of them have these lives that existed before page one. It’s a book where you feel like you’ve been dropped into the world, not that it was created on page one. All of them have their little quirks, their flaws, and their loves. Whether they are instantly your favorite, like Hesina, or worm their way into your heart like Sanjin, each one of these are precious to me. And you can see pieces of yourself reflected in each of them. Hesina’s quest for justice, Caiyan’s fierce protection, Lillian’s feisty spirit, the way Sanjin and Hesina wound each other. There are moments that wrench your heart into your throat. This could be because they are just so utterly relatable, like Hesina’s relationship with her brother, or because they evoke your desires, Lillian’s spirit. I think I have made it abundantly clear how much and deeply I love Descendant of the Crane. But if you needed another reason, it is gorgeously written. Whether it be a precious glimmer of humanity, of the ways we hurt each other, or deny the truth from ourselves. Or if it is the description of our loneliness, our tender feelings. There are passages that just took my breath away and my whole copy is littered with highlights. 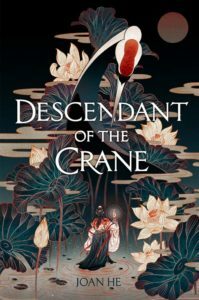 If you enjoy fantasy that is rich, characters that captivate you, and a story that will leave you gasping, then pre-order Descendant of the Crane. Find Descendant of the Crane on Goodreads, Amazon, Indiebound & The Book Depository. What book cover would you frame and put on your wall? Because I am obsessed with this one! Great review! I can’t wait to read this book!